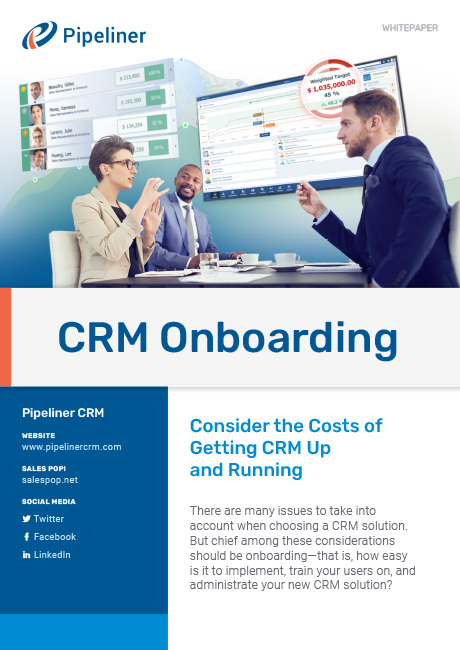 Pipeliner CRM onboarding is faster & at a fraction of the cost of other CRM systems! In fact, statistics show that Pipeliner can be onboarded in a fraction of the time—and at a fraction of the cost—of our chief competitors. Many companies around the world have found that they were able to onboard Pipeliner CRM without any assistance. Plentiful information is available through our Pipeliner Help Center to get you up and running. The Get Started with Pipeliner page has a complete list of guides and tutorials. 57% of Pipeliner CRM customers reported that they do not need an administrator at all—even for customization. 0% require a full-time administrator. 41% of Pipeliner CRM customers reported that it took 1 to 5 days. Fourteen percent said it took less than 1 day. Complex platform CRM means 2x the license costs. Emphasizes technology stack. IT is in control. Minimal due to Pipeliner CRM’s Targeted, Business-Forward approach. Emphasizes business results. IT supports Sales decisions. Contact us today for assistance in getting Pipeliner CRM off to a great start in your company! Want to read more about the importance of onboarding? Visit our Sales Reference Library and download our ebook CRM Onboarding. Choosing a CRM? One issue, that might have the highest impact on your ROI are the onboarding costs of the CRM solution you choose.